One of the best ways to de-stress while staying healthy is through exercise. However, many of us cringe at the idea of spending time at the gym. Luckily, there is a much more relaxing option that offers many of the same benefits. 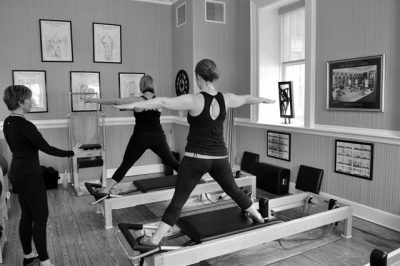 Mountain Laurel Pilates at Hawley Silk Mill is a full-service Pilates studio that offers a welcoming, warm, and friendly atmosphere for visitors hoping to work out their stress while restoring peace of mind. Interested in Mountain Laurel Pilates? You may also want to check out the Lake Region Fitness Center at Hawley Silk Mill! This state-of-the-art facility offers everything you need to stay in shape and feel fantastic. Developed in the early 1900s, Pilates is a form of exercise that focuses on strengthening and toning the body. The goal of Pilates is to achieve a “mind-body” connection through precise and energizing flow movements. It is effective, challenging, and a perfect combination of exercising the mind, body, and spirit. Pilates is also a great option for golfers, runners, bicyclists, and those suffering from weak backs. This is because the movements used in Pilates increases endurance, strength, and joint health. 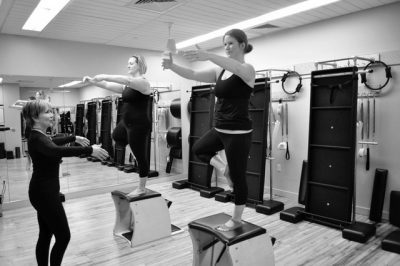 From group classes to private instruction, Mountain Laurel Pilates has it all! Judy Fink is a fully-certified instructor who believes in sharing her knowledge of Pilates in a non-competitive and welcoming atmosphere. You will receive only the highest-quality instruction and guidance available based on the system of exercises developed by Pilates’ founder, Joseph H. Pilates. The workout will be tailored to your body and capabilities so you can learn and improve in a setting defined by professionalism and energy. Want to start today? Take a look at the Mountain Laurel Pilates schedule and find a class that is best for you! Mountain Laurel Pilates is just one of the new places to see at Hawley Silk Mill! Be sure to stop by and discover these brand new shops. This charming children’s boutique specializes in clothing, unique toys, and essentials for little boys and girls aged newborn through 8. Alice and Hamish is an ideal spot to find gifts for your family back home or items that your own children will love! Since its construction in 1880, Hawley Silk Mill has been an integral part of the Hawley community. Although its operation as a mill ended many years ago, it continues to attract visitors and locals as a lifestyle center! With a quaint coffee shop, unique shopping, an art gallery, and so much more, Hawley Silk Mill is truly a one-of-a-kind destination. It’s also a great place to meet and interact with locals and visitors just like you. Add Hawley Silk Mill to your Pocono Mountains “must dos” and we look forward to welcoming you soon!